I was asked if I would like to review a new book called "The Day That A Ran Away" and after looking at the information about the book, I jumped at the chance! 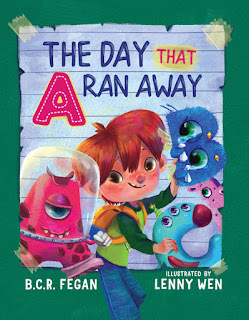 "The Day That A Ran Away" by B. C. R. Fegan is a hilarious story where the teacher, Mrs. May ask a student Jet, why he didn't write down the alphabet? He goes on to tell her why each letter of the alphabet left his page while he was walking to school that day! You'll have to read on to see what happens to Jet after giving her his clever excuse! The beautiful illustrations by Lenny Wen have things on each page that start with the letter. This is a great book to teach the order of the alphabet, letter identification, beginning sounds, rhyming words, and predicting. I am thrilled to have the opportunity to give a book to one lucky reader thanks to Arielle at TaleBlade Press. This giveaway will start on Sunday and end at 11:59pm on Wednesday. Enter below using Rafflecopter. By sharing the giveaway you can come back and enter daily. Click on the above picture if you would like to purchase the book. You will have 48 hours to respond to my email with your mailing address so I can send it to the publisher or I will select another winner. Mr. Fegan is also the author of the book I gave away earlier this year called "Don't Ever Look Behind Door 32."